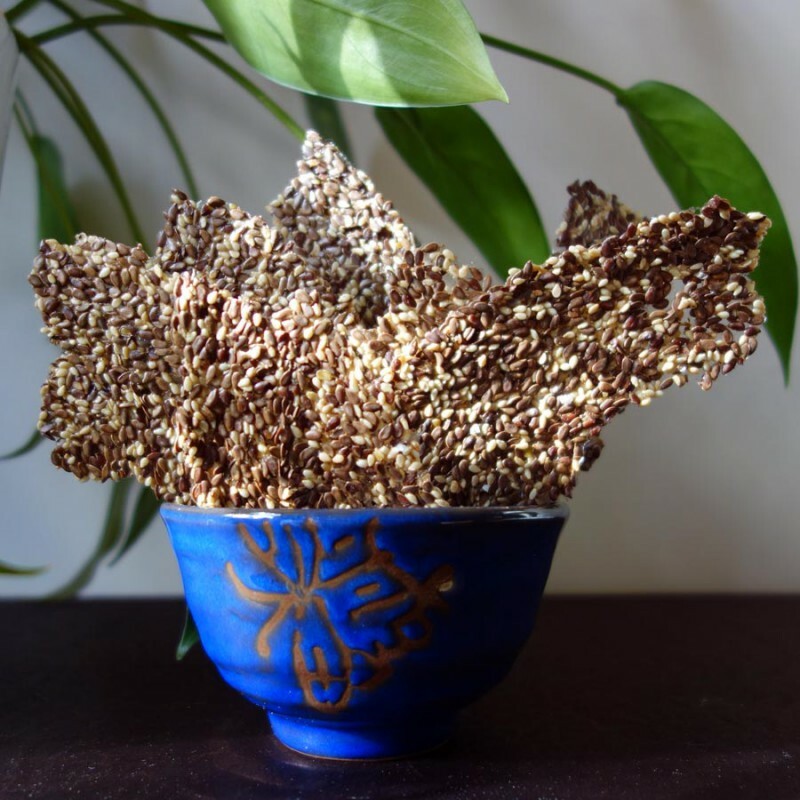 A dramatic, yet simple flaxseed and sesame cracker that goes great with dips or crumbled on a salad for extra crunch. Psst… it’s good for your health! Special Equipment (if dehydrating): 3 plastic fruit roll sheets for dehydrator. In a medium bowl, soak flax seeds in water with salt for one hour. Mix in sesame seeds. In food dehydrator: Using an offset spatula, spread the mixture on the plastic sheets, very thinly, so you have one layer. Try to avoid having holes. It’s a little challenging. Sprinkle with sea salt and freshly ground pepper. Place the sheets on the dehydrator trays and cover with the lid. Dehydrate on high for four hours. In an oven: Preheat oven to 350 °. Line a sheet pan with silpat or silicone baking sheet liners. Using an offset spatula, spread the mixture on the plastic sheets, very thinly, so you have one layer. Try to avoid having holes. It’s a little challenging. Sprinkle with sea salt and freshly ground pepper. Press the toppings into the crackers gently with the spatula. Bake for 15-20 minutes, until the wafers are crisp and dry. I break off and remove the dry, crisp parts of the crackers and cook the moist parts until they are done. The above cooking time is for baking the crackers. Dehydrating them will take four hours depending on how thin you make them. You can also make them thicker, but the “cooking” or “drying” time must be increased. *Use toasted sesame seeds if you’re making the dehydrated version. Use raw sesame seeds if you’re baking the crackers. EVERYTHING FLAXSEED CRACKERS variation: Prior to baking sprinkle the crackers with poppy seed, garlic and onion flakes Press the toppings into the crackers gently with the spatula. .
MIDDLE EASTERN FLAXSEED CRACKERS variation: Prior to baking crush coriander seeds, fennel seeds and cumin seeds and sprinkle them on the EVERYTHING FLAXSEED CRACKERS. Press the toppings into the crackers gently with the spatula.